If England may justly boast of her Stonehenge as the noblest monument of its kind now existing, Ireland can, with equal reason, feel proud of the sepulchral tumulus of New Grange--a monument of human labour only exceeded in grandeur by the tomb of Agamemnon, at Mycenae, or the pyramids of the Egyptian Kings, to both of which it is so nearly allied in many of its general features and which, in point of antiquity it probably rivals, or even possibly exceeds. The tumulus of New Grange, is one of the four great sepulchral mounds situate on the banks of the Boyne, between Drogheda and Slane, in the county of Meath, and which we will not hesitate to say may justly be termed the Pyramids of Ireland. It is the only one of the four whose interior is now exposed to human curiosity. The contents of the others are still unknown; but there is every reason to believe that if explored, they would be found similar in their nature, and not inferior in rude magnificence to that of which we are about to give a description. This extraordinary monument or pyramid, which is now, as the learned antiquary, Governor Pownal, truly observed, but a ruin of what it originally was, covers two acres of ground, and has an elevation of about 70 feet; but its original height was not less than 100 feet, as it has been used for ages as a stone quarry, for the making and repairing of roads and the erection of buildings, &c., in the neighbourhood. It is formed of small stones, covered over with earth; and at its base was encircled by a line of stones, of enormous magnitude, placed in erect positions, and varying in height, from 4 to 11 feet above the ground, and supposed to weigh from ten to twelve tons, each. Of these stones, ten only remained about fifty years back; and one has since been removed. About a century ago, there was also a large pillar stone, or stele, on the summit of the mount, now also destroyed. These stones, as well as those of which the grand interior chamber is built, are not found in the neighbourhood of the Pyramid, but have been brought hither from the mouth of the river Boyne--a distance of seven or eight miles. 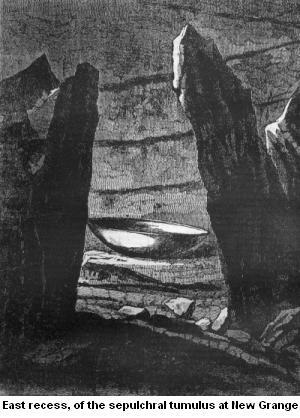 The interior of the tumulus was first explored about the year 1699, when a Mr. Campbell, who resided in the neighbouring village of New Grange, in carrying away stones to repair a road, discovered the entrance to the gallery, or passage leading into the chamber. This entrance was about 50 feet from the original side of the Pyramid, and is placed due south, and runs northward. The length of this passage to the entrance of the chamber, is about 58 feet; its breadth at the opening, 3 feet, and its height, 1 foot 6 inches. At the distance of about 18 feet from the entrance, the passage gradually narrows till it reaches a stone which is laid across in an inclined position, and which seems to forbid further progress. At this point the passage is narrowed to one and a half foot in height and breadth. Persons of moderate size, however, can overcome this obstacle by turning on their sides and edging their bodies round by the assistance of their elbow and foot. This difficulty passed, the gallery presents no further obstacle, as it immediately expands again, to the width of 3 feet, and to a height of 6 feet; which gradually encreases to 10 feet 6 inches at the entrance of the Dome. The chamber is an irregular circle, about 22 feet in diameter, covered with a dome of a bee-hive form, constructed of massive stones, laid horizontally, and projecting one beyond the other, till they approximate, and are finally capped with a single one: the height of the dome is about 20 feet; the chamber has three quadrangular recesses, forming a cross--one facing the entrance gallery, and one on each side. In each of these recesses were placed a stone urn, or sarcophagus, of a simple bowl form, two of which remain. Of these recesses, the east and the west are about 8 feet square; the north is somewhat deeper. The entire length of the cavern, from the entrance of the gallery to the end of the recess, is 81 feet 8 inches. The stones of which the entire structure consists, are of great size: those which form the lintels or roof of the gallery, are but six in number; and, of these, the first is twelve feet four inches long, the third eighteen feet, and the fifth about twelve feet; the breadth of these stones is not less than six feet. The tallest of the upright stones forming the entrance to the recess represented in the engraving, is seven feet six inches in height, and its companion seven feet. The vase or urn within this chamber, is three feet eight inches in diameter; that in the opposite chamber is displaced from its supporter: these urns are of granite. A great number of the stones within the chamber, as well as in the gallery, are carved with spiral, lozenge shaped, and zig-zag lines; and in the west chamber there are marks which have been supposed to to be an alphabetic inscription; but, as we are persuaded, without reason. To this general description we have only to add, that on the first examination of the interior of the sepulchre, a pyramidal or obeliscal stone, six or seven feet in height, is said to have stood in the centre, near which the skeletons of two human bodies were found; and that about the same period, two gold Roman coins were discovered on the top of the Mount--the one of the elder Valentinian, and the other of Theodosius. This most ancient, and, though rude, most magnificent monument, has been described and illustrated by Molyneaux, Harris, Pownall and Ledwich, all of whom, unwilling, apparently, to allow the ancient Irish the honor of erecting a work of such vast labour and grandeur, concur in ascribing it to the piratical Danes, who infested the island in the 9th and 10th centuries. We are well aware that the Danes as well as all the other branches of the great Scythian stock, raised large sepulchral Mounds; but where in the north of Europe does there exist a monument of the kind, to rival this and its companions, on the Boyne? And is it likely that Danish colonies, in a country in which they had never a secure settlement, would raise monuments exceeding in grandeur any which existed in their own country? Or if they might, is it to be believed that tradition would be silent, or that our annals, which are so minute in recording the works as well as deeds of those lawless robbers would preserve no memorial of so vast a labour? No! it is to the anciently civilized south of Europe, not the barbarous north, that we must look for the prototypes of those grand monuments of the dead; which, equally, with the brazen weapons and vessels, the cyclopean forts, and other remains, identify the ancient inhabitants of Ireland with the most ancient Egyptians and the Greeks of the heroic times. The arguments of those learned men above alluded to in support of their hypothesis, are puerile, and scarcely deserve serious notice; we are not without historic evidence to prove that the Danes, so far from being the erectors of the monuments on the Boyne, were as might be more rationally expected, their destroying plunderers. The limits, however, allotted to a single paper, in our little Journal, will not allow us now to enter on this investigation with the copiousness which the subject merits and requires; but we shall return to it speedily, with other woodcut illustrations, indispensably necessary to our purpose. We must not, however, conclude without acquainting our readers that the very able wood-cut prefixed, which is the best illustration hitherto given to the public of any portion of this venerable monument, is engraved from an original drawing, made expressly for our Journal, by Mr. Nicholl, of Belfast, a young artist of undoubted ability, whose talents, we are persuaded, only require the fosterage they merit to make them, ere long, reflect honor on our country.